Clive is set to executive produce this 12 x 1 hour series for TV, alongside Steve Hoban and Clark Peterson. Clive will also act as Creative Consultant to the project which is written by Judith and Garfield Reeves-Stevens. By the end of the pilot episode, the audience has been introduced to the three lead characters who drive the series - Father Francis Panati, reporter Susan Foster, and rookie cop Jim Hyams - and the two main characters at its heart - teenagers David Almagro and Jamie Sandoval. As these characters move forward and interact on their individual journeys, they also discover that their fates have been entwined from the beginning, reaching back to the very first events of the series' backstory, more than thirty years earlier. Connecting all the mysteries to be solved and revelations to be discovered over the course of the series will be these five characters' attempt to answer the question first posed by Panati in his introductory scene: Is all that has happened by chance, or by design? Clive : "This is the next evolution in genetics. It is mutation of the spirit." 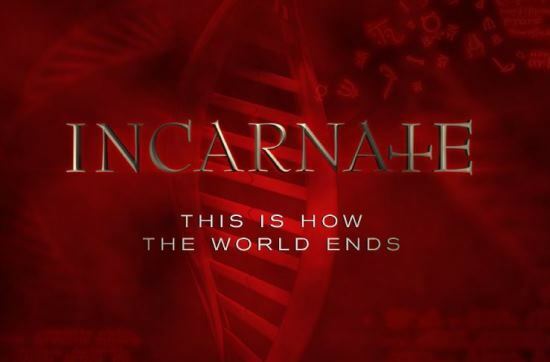 Bernd Schlötterer (CEO, Palatin Media) : "Incarnate is a new series that pushes limits in all directions, with compelling characters, shocking story lines and unprecedented cinematic visuals. Barker describes it as X-Men meets The Exorcist in a modern-day drama series about a force of evil living in our midst and three unlikely heroes who must work together to stop it." Steven Hoban (Copperheart Entertainment) : "We also have a TV series called Incarnate that Clive is involved with. It was created by Judith and Garfield Reeves-Stevens, who were behind the American version of Primeval and writer/producers on Star Trek: Enterprise; they're great Canadian genre-TV writers. They came up with this show based on a book that Gar had written years earlier, which is basically a very cool supernatural procedural. Clive is an executive producer, and a creative consultant; he's been working on the characters and the story with Judy and Gar, and he has become a kind of unofficial production designer. He's such a terrific artist; he's created what he calls his 'morgue of imagery,' and has been sending us this great artwork." Christmas Horror Story Creator Talks Sequel, Clive Barker Projects, More Ginger Snaps?